Leftover rum-soaked Christmas pudding makes a fabulously rich filling, along with more cinnamon and brown sugar, for classic cinnamon rolls. If you don’t have leftover pud, feel free to use just brown sugar and cinnamon. As expats, we’ve moved around a lot. Most houses had company furniture and the carpets and paintings and personal effects were the only things that made them feel like ours. We’d tell our girls, “Home is where we are all together.” This got more challenging when both girls went off to university and their father and I continued to move. They have bedrooms with some of their stuff in our current house in Dubai, but it would be a far stretch to say it’s home for them since they’ve never really lived there, except for holidays. This year we are taking that mantra to extremes, celebrating Christmas and New Year’s Eve in a rented house, found on Airbnb. We didn’t know if our elder daughter would have any time off from her job and, so, if Christmas was going to be spent as a family, as it must be, we would have to come to her. We flew in from Dubai, collected younger daughter from her school housing, elder daughter from New York, and then both grandmothers flew up from Texas. The house is full! It's now a home. This is a big, long prelude to telling you that we find ourselves in the small Rhode Island town of Tiverton where the only grocery store didn’t have any yeast on Christmas Eve. And younger daughter wanted to make cinnamon rolls to bake on Christmas morning. In desperation, I went into the small pizza place across from the grocery store and asked if they could sell me some yeast. The kind owner did better than that! 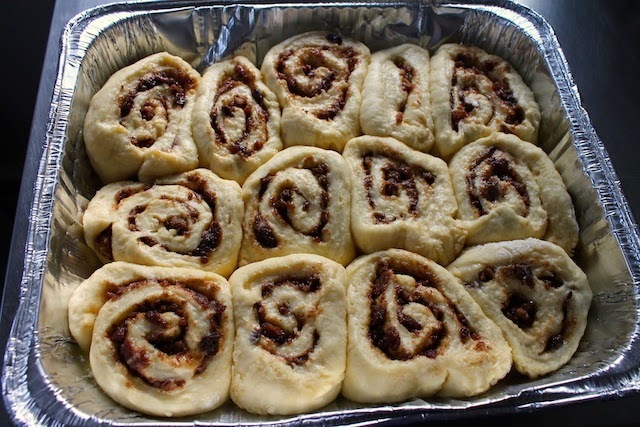 He handed over a large chunk of fresh yeast with a hearty “Merry Christmas!” We had traditional cinnamon rolls on Christmas morning and then I made a pan of these non-traditional ones to bring to Classic Pizza as a thank you. It makes the perfect recipe for my first post for #TwelveLoaves, a group dedicated to bread in all its forms. This month’s theme is Keep It Simple, and what could be easier than a yeast bread that doesn’t requiring an electric mixer or any kneading? Credit for the traditional cinnamon roll recipe goes to Baked Bree. Warm your milk to about 125°F or 52°C. If you don’t have a thermometer, just warm it until it’s hot but you can still put your finger in it comfortably for 15 seconds without wanting to pull it back out and shout, “Ouch.” Pour it into a small bowl and then crumble in the fresh yeast or sprinkle on the dried yeast. Add one teaspoon of sugar and give the mixture a gentle stir. Set aside. In a large bowl, whisk your eggs, butter, sugar and salt until well combined. Check on your milk/yeast mixture. It should look frothy on top. If it’s not, your yeast is dead and you need to buy more. Let’s assume yours is frothy. Pour it into the bowl with the egg mixture and whisk well. Add in 1/2 cup or 125g of flour and mix well. You will have a thick batter. Now add in the rest of the flour 1 cup or about 250g at a time, mixing with a wooden spoon or stiff spatula. You will have very soft dough and it may look like the flour won’t all mix in. Never mind. We are keeping it simple! Just trust and cover the bowl with cling film and a towel and put it in warm place for one hour. Meanwhile, make your filling by combining all of your ingredients in a medium-sized bowl and stirring with a fork until thoroughly mixed. Grease your baking pan liberally with butter. Choose one that will comfortably hold about 12 or 13 large cinnamon rolls. Mine was 11 3/4 x 9 1/4 in or 30 x 24cm. When the hour is up, punch down the dough and sprinkle your work surface lightly with flour. Roll the dough out in a rectangle about 12 x 18 in or 30 x 45cm. Sprinkle on your filling of choice and make sure you get some all the way out to the edges. Roll the dough up from the long side. Cut the roll into 1 1/2 in or 3 3/4cm slices and put them cut side up in your prepared baking pan. Cover the pan with cling film and a towel and put in a warm place to rise for another hour. When the hour is almost up, preheat your oven to 400°F or 200°C. Bake your rolls in the preheated oven for 10 to 15 minutes or until golden brown and cooked through. Serve plain or with cream cheese icing. Or give the whole pan to someone who saved Christmas breakfast for you and wish them a Happy New Year! 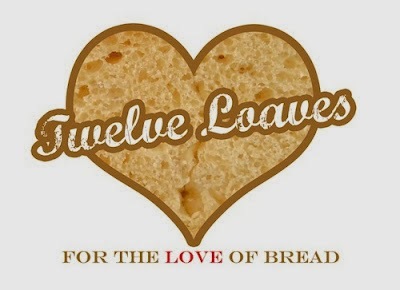 If you love bread but have found the holidays hectic, this is the #TwelveLoaves month for you! Check out all of our recipes that Keep It Simple! If you’d like to join us for this month’s #TwelveLoaves Keep It Simple challenge, choose a recipe that is not overly complicated, whether in technique or ingredients. Then share your January Keep It Simple Bread (yeast or quick bread) on your blog. If you’d like to add your bread to the collection with the Linky Tool this month, here are the rules! 1. When you post your Twelve Loaves bread recipe on your blog, make sure that you mention the Twelve Loaves challenge in your blog post; this helps us to get more members as well as share everyone's posts. 2. Post your Twelve Loaves bread on your blog by January 31, 2014. 3. It must be a bread inspired by the Twelve Loaves Keep It Simple theme, baked between January 1, 2014 and January 31, 2014. #TwelveLoaves is a monthly bread baking party created by Lora from Cake Duchess. #TwelveLoaves runs so smoothly thanks to the talented and brilliant help of both Paula from Vintage Kitchen Notes and Renee from Magnolia Days. It's so great you got to spend the holidays with your family. It's so true that home is where you make it and not defined by the objects in it. Very nice of the pizza place to give you the yeast and very, very nice that kneading is not necessary with these lovely cinnamon rolls. That's a great story. Also, I don't trust myself with the knowledge that these can be made so easily. Christmas Pudding with the no knead tecnique is a great idea. I've to try it. Stacy, I love this story!!! the true Christmas spirit embodied! and I love that you added leftover rum-soaked Christmas pudding!! how fabulous! Happy New Year!! Wishing you and your family a wonderful 2014! Cheers! They couldn't be easier, Liz. Happy New Year to you and your family as well! It's been a wonderful couple of weeks, Renee. My own house is going to seem very quiet when I get back home on Monday. Best of all, Dai, you can let the rolls rise the second time in the refrigerator overnight, right in their baking pan. Let them come to room temperature and then bake for delicious cinnamon rolls first thing in the morning! It made our Christmas, Alice! And the pizza folks were so delighted when I came back with the full pan of cinnamon rolls as a thank you. Happy New Year to you and yours too! Happy New Year to you too, Rossella! So happy to get to know you through Twelve Loaves! What a great story! I am amazed at how you brought everyone together. That pizza shop owner is a sweetheart. Beautiful rolls. This was a sweet post to read, Stacy. I love hearing about your travels. I remember seeing your rolls on IG and thought what a great and delicious gift they were for Classic Pizza! Love your rolls (super photos!). Happy New Year, my friend! Stacy....you have no idea how badly I want a taste of these! First of all...I've never had Christmas pudding, and that alone looks fabulous! To put it together with these cinnamon rolls is amazing. And what a great story you've shared. I love that there are people like the owner of classic pizza....and you....who shared back! Happy new year....wishing all the best to you and your family! How wonderful that you were all able to spend the holidays together - believe me, as someone else who has lived away from family for a long time I know how magical that feels. Your recipe reminds me of a dessert I had in a restaurant last year, and I always meant to try and replicate it, but now I have your recipe. I am looking forward to trying this, and if I don't use Christmas pudding I know I have some fruit mince that may be good in it too. WHY HAVE I LIVED MY WHOLE LIFE NEVER HAVING EATEN ONE OF THESE?! That is wonderful how you brought your family together for Christmas. I hope you all had a wonderful time together and I am sure these cinnamon rolls brought many smiles! Safe travels and Happy New Year! I am really curious to try Christmas pudding! I've never had it before. I'll be sure to save some leftovers for these cinnamon rolls. I am a sucker for cinnamon rolls! I love, love, the idea of renting a house and 'going to' the kids! That never even occurred to me before and I shall tuck it away for next year. I spent many years after high school going to my parents' houses (which were always technically 'home' but not in the way that most people think of it) and I suppose that my boys will do that as well - it's true that home is really where we are all together! We put #1 on a plane on Monday (sob) but will be wrapping up our holidays with beignets tomorrow morning - usually do it for Christmas but we had a snarl of delays and confusion and ended up with Christmas morning on Christmas night and no beignets. I always head to your blog when I'm looking for recipes, so I'm sure I'll be back once I get over my Christmas baking burnout (I feel like I'm ready to broil salmon and steam broccoli for at least a month, just to recover from holiday overload!) Happy New Year to you all, and hope it's a fabulous 2014!!!! My goodness this looks fabulous! And now I see where you are and what you are doing in those lovely fb pictures!! You made amazing cinnamon rolls! The pudding tip is awesome. Have a great 2014! I think mince pies and/or mince pie filling would work beautifully, Laura. What's a little extra crust between friends? I completely understand the need for cold desserts in summer. We lived in the Far East for so many years and it was always warm, all year round. We tend to have pecan and pumpkin pies, both served room temperature anyway and occasionally Christmas pud. And I don't serve that warm either. Simon is in charge of the brandy butter! I think renting a place and staying for a few weeks is the only way to really get to know a place, so I love your idea, Paula. Choose somewhere good and I'll come visit. :) Happy New Year to you too! No kneading is the best part, Ishita! It really is an easy recipe and the Z Sisters will love it. It's been quite the change of scenery, Kelli. Especially the snow! Broiled salmon and steamed broccoli sound divine after the weeks of indulgence, Carolyn! I need to get on your program. After the beignets, of course. I love that Christmas morning tradition! Happy New Year to you and yours as well! Thanks for sharing, Joanne! Wishing you your best year yet in 2014! I DON'T KNOW, KAYLE! Time to rectify that! They were great but I don't think I got more than one. Next time I'm making a double batch!